Our best-selling original: The SmashTerminator® Classic Series Sports Armband combines hard-wearing Neoprene and soft, flexible Lycra to create an ultra lightweight, comfortable and high-quality fitness product at an affordable price. Use it anywhere: Whether it’s pounding the streets of your local fun run, hitting the gym for some weight training, or even enjoying sport with friends, our Classic Series armband is the ideal workout companion. keep all your favourite music and apps readily accessible, whilst ensuring your precious Smartphone stays safe, dry and secure during use. Extra Features: A special sweat-resistant layer ensures your device stays dry, a reflective strip keeps you visible if exercising in low light conditions and a handy key holder helps streamline your workout. Hand-washable with light soap and water/air dry. What are you waiting for?! Join the thousands of customers who are already enjoying the quality and versatility of this great product. Buy smart and make the Smash Terminator® Classic Sports Armband part of your fitness routine today. Includes 18-month warranty and friendly customer service. Smash Terminator® Classic Series Sports Armband. Safely carry and use your iPod on the go, while retaining full access to all your favourite music and apps. Constructed from hard-wearing Neoprene and soft, flexible Lycra, the Classic series is lightweight, comfortable and built to last! Designed to fit the iPod Touch 1st-7th Generation, but also suitable for many of the latest Smartphones with displays up to 4 inches, including the iPhone 5s and SE! The touch sensitive transparent window allows you full, unrestricted access to your device, whilst handy cut-outs on the reverse give you the option to attach your headphones via your phones auxiliary port. A reflective silver frame stands out clearly in the dark, keeping you safe when exercising in low light conditions. Your satisfaction is our number one priority, so if for any reason you are not happy with any product from SmashTerminator®, please do not hesitate to contact us and we’ll do our best to solve your problem quickly and efficiently! We take full ownership and responsibility for the quality of our products. We are the number one UK based seller for Sports armbands and are fully VAT registered. 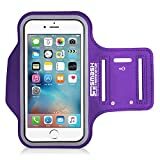 Sony Z5 | Z4 | X | XA | E5 | Z1, 2, 3 & X Compact Running Armband | Smash Terminator Sports Gym Exercise Jogging Arm Band Case Cover Holder for Sony Xperia Smartphones. Made from Premium Neoprene & Lycra Featuring a Special Sweat-proof Layer, Reflective Strip and Key Slot by SmashTerminator® (As Seen in Runners World Magazine - 5 Stars) 18-month Warranty Included.